Infrastructure Minister Chris Hazzard today visited the Cutt’s Sluice Structure on the River Bann at Coleraine. The Cutt’s Sluice Structure is one of five control structures on the Lough Neagh/Bann system operated by the Department for Infrastructure’s (DFI) Rivers Agency. The Minister was able to see first hand how these essential pieces of infrastructure control water levels in the Lough Neagh/Bann system. The Minister also took the opportunity to meet local Rivers Agency staff who helped deal with the winter flooding of 2015 when Lough Neagh water levels were the highest ever recorded. 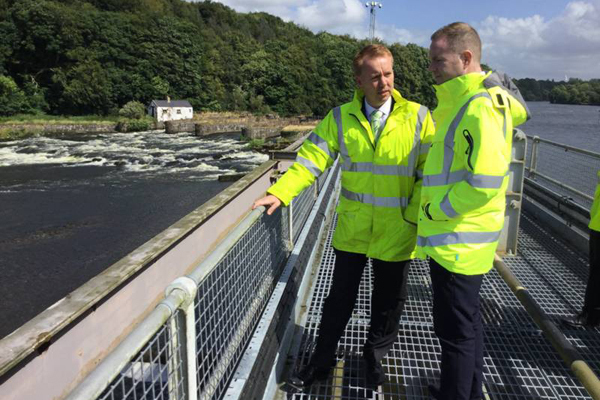 “These sluice gates are a vital piece of infrastructure which my Department has responsibility for. The system of sluice gates regulates water levels on Lough Neagh and flows in the River Bann, the principal river system in the North. “This system drains 43% of the land mass of the North so I wanted to see for myself how this system works. This plays such a vital role for a large range of stakeholders particularly in times of heavy rainfall when these gates are managed to minimise the effects of flooding. All media queries should be directed to the Department for Infrastructure Press Office on 028 9054 0007. Out of hours please contact the duty press officer via pager number 076 9971 5440 and your call will be returned.